Needless to say, I was fuming. Reminded, once again, that ours is a profession dominated by sanctimonious, holier-than-thou, isn’t-everything-so-Enid-Blytony, do gooders, determined to make the rest of us- the actual humans- look like a bunch of tossers who couldn’t care less about darling little Johnny and the rest of his pubescent cronies. These do-gooders are those who go on about educating ‘the whole child’ as opposed to the rest of us who presumably only care about the elbow bit of the child. Or the bit between the nose and the upper lip that everyone says is called the septum, but doubtfully so, worrying that they might have got this mixed up with the perineum. These do-gooders are those who bang on about Pastoral this and Pastoral that, looking upon any teacher who shows the faintest interest in academic achievement as a Gradgrindian monster whose sole purpose in life is to enforce suffering and subjugation. These do-gooders are the ones in at 7am until 7pm just to tell people that they were in at 7am till 7.30pm. They’re the teachers who rail against those who sell resources for money on TES, exclaiming ‘education should be free for all!’ without considering that actually, you know, some of us are bloody poor and could do with an extra few quid. These do-gooders, they’re the ones who frown at those who swear about little Johnny in the staff room, as if they actually meant it when they called him a feckless shite, when in fact, of course they didn’t mean it. But, they’re human, and sometimes, slagging someone off makes people feel good. I understand that there’s an argument for modelling good behaviour; that, as teachers, we should be paragons of virtue for all and sundry. But I disagree. And so do the kids. They know what’s real and what isn’t. Why do you think they constantly criticise those teachers who change the moment another teacher is in observing? Kids value authenticity. And the Mother Teresa act just ain’t genuine. There’s a mental health crisis in our schools. We’re overworked and we’re stressed and we’re crumbling. Many of us are leaving work feeling worthless. This saintliness, exhibited by so many of our colleagues, is not on. It’s an act designed for their own apotheosis at the cost of others’ denigration. So, please, for the sake of our students. Actually, no, this time-sod the students. For the sake of us- the colleagues who come to work to get the job done and occasionally hate it a little bit-for our sakes…can we stop with the mother Teresa act? It’s not doing anybody any good. Author PositivTeachaPosted on January 16, 2017 November 28, 2017 2 Comments on Too Many Saints. Any attempt to ‘normalise’ terms such as GEEK for the end purpose of making intelligence ‘cool’is, in my humble opinion, informed by my own personal experiences and nothing else, doomed from the off. Whilst I’m plagued by a crushing awareness of my own paltry contributions to the academic world of which I so long to be a valuable part, the kids I teach aren’t aware of this fact. In fact, to the kids I teach, it’s a surprise that I manage to squeeze my fat, bloated ego through the door every day. Because I’m always bangin’ on about everything I know. All the flipping time. Not in a bitter, twisted, ‘I know more than them’ way, but in a ‘I woke up this morning and I literally smiled when I saw my face and realised how flipping brilliantly clever I am’ kinda way. Of course, the kids laugh and they jeer and they poke fun. But they’re also a little bit impressed. They are plagued by self-doubt in many areas of their lives and I’ve shown them that simply knowing more than someone else is something that can make you feel good. Selfish perhaps, but true. It’s the first thing I tell kids. I’m not going to stand there and condescend them by explaining that there’s a book for them and they just need to find it. I’m not going to tell them that books will engross them for hours and hours on end. I’m not going to say that books are the best things on the planet. Because, for the kids we teach, the best thing on the planet is anything which allows you to laugh at other people’s misfortune on the internet. What I will tell them is this: ‘You won’t reap the benefits of working hard or reading or doing your homework right from the off. These things don’t provide the instant multi-sensory thrill that Call of Duty can-and does-provide. But, if you want to ever get somewhere in life, you need to play the long game. It’s simple as this: smarter people lead more successful lives than those that aren’t as smart. So get smart.’ And I tell them this, time and time, and time again. 3.I teach kids stuff they’ve never learned before. We need to work hard at giving kids the thrill that learning can provide. We can’t be complacent. As a teacher, I’m sick of teaching metaphor and simile year after year after year. Because of the benefits of overlearning, I do need to go over this stuff again and again, but that doesn’t have to be the sum total of my intellectual repertoire. And so, I go home and I read stuff. I read about polysyndeton, and anadiplosis. I read about framed narratives and compound-complex sentences. I read about ethos and pathos and logos. And then, when I’ve made sense of it all, I teach it to kids. They know with me they’ll get stuff that challenges them and they love it. They see me in the corridor and shout out words I’ve taught them four years ago (mellifluous, nidificate); they proudly tell me they’ve bamboozled other English teachers with concepts I’ve taught them; they come in and ask me if Martin Luther King was a man who used ‘pathos’ to great effect. And I tell them ‘yes’. Yes. Yes. Yes. 4. I let them see me using knowledge for my own advantage. I recently got a class to learn, off by heart, Inspector Goole’s ‘Millions and Millions’ speech from the closing of An Inspector Calls. Staff frowned: “Why do they need to know the whole speech?” There are myriad benefits of knowing the whole of this speech, and if you’re someone who is also questioning the value of such a task, shame on you. Anyway, a few lessons later, when writing a question on the opening of the play, I improved my model answer by making reference to-and quoting from-the inspector’s speech that I’d also learnt off by heart, with the kids, some lessons previously. “Yes! My answer’s the best! Ha! Have that you lot!” I beamed. “I remembered the speech and it’s made my answer better than yours. Get in!” So what did the kids do? Whimper, whine and waste away in self pity? Not at all. They rose to the challenge is what they did. And over the course of a few weeks, kids were able to use their recollection of Goole’s speech to elucidate their analysis of other aspects of the play. Being clever had a practical advantage. It’s no longer just a status symbol (see points, 1 and 3, above). So, that’s what I do to make being clever, cool. Author PositivTeachaPosted on January 2, 2017 1 Comment on Making Clever, Cool. Set your alarm for 5.45am. Snooze till 6. Then, jump into the shower. Spend just 4 minutes in the shower and be sure to think about that class you’re looking forward to teaching and that colleague (we all have one) you’re hoping smiles at you later on today in the staff room. After the shower, whack on your underwear, and then a dressing gown. Check the baby is breathing. Perhaps kiss her, just to see if she moves. She moves. Amazing. But also dangerous…tread lightly down the stairs. Must not wake her. Turn on the George Foreman. Whilst you’re waiting for that to heat, fill a small saucepan with cold water and add a drop of white wine vinegar. By now the kettle has boiled so make yourself a coffee. Always black, never sugar. George Foreman still isn’t on so go into the living room and set up the ironing board and switch on the iron. The George Foreman is ready- you hear it click. 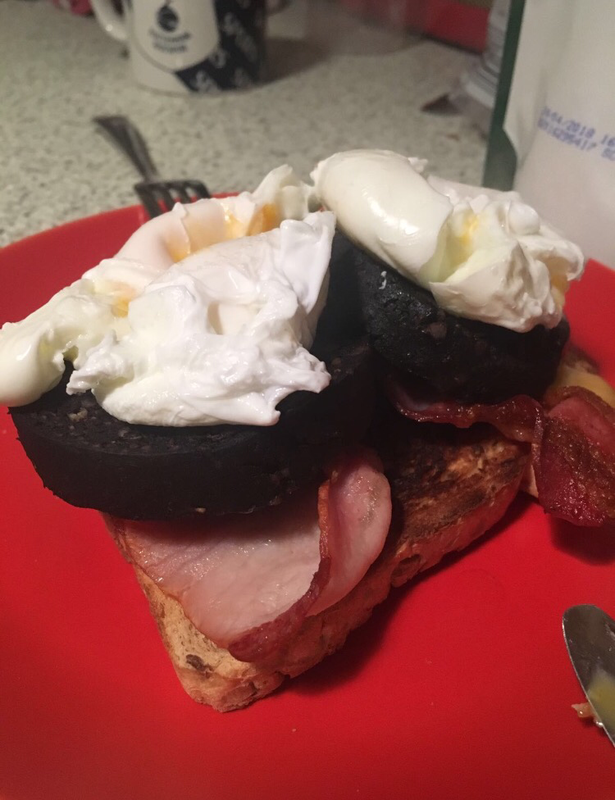 Back in the kitchen, from the fridge remove two slices of Aldi Lancashire Black Pudding. It’s very important that you’re using Aldi black pudding- the texture and the spices surpass all other brands of black pudding. Put these in the George alongside two rashers of smoked back bacon. Now turn on the gas to heat the saucepan of water. Whilst you’re waiting for that to come to the boil, go and iron your shirt. It’s now 6.23 by the way. Once the shirt is ironed, the water will be boiling. Black pudding and bacon cooking nicely on the George. Use a spoon to swirl the boiling water in the saucepan and add two large eggs. These eggs must cook for two minutes and forty five seconds. Whack some bread in the toaster. One slice. Once the eggs are done, remove using a slotted spoon and allow them to rest on a piece of kitchen towel. Put the toast on a plate and add the bacon, and then the black pudding. Be careful with it- it may crumble. It’s like a paste inside. Divine. Top with the eggs. Consume. After breakfast, finish your coffee. Go upstairs, get back into bed and feel the warmth of the person you love best for ten more minutes. Hop out of bed, moisturise (just the face), dress (always a tie pin), and finish with some aftershave (Issey Miyake- one spray on the left wrist followed by two on the shirt. It’s a bit much but there’s a half hour drive to work so it’ll calm down by the time you arrive). Drive to work listening to songs that allow you to pretend you’re in a music video. Get to work. Teach. Come home. Repeat. Author PositivTeachaPosted on January 1, 2017 1 Comment on The School Morning Routine.